The following document explains how to create a new event using the iOS Calendar app (iPhone, iPad, or iPod Touch). 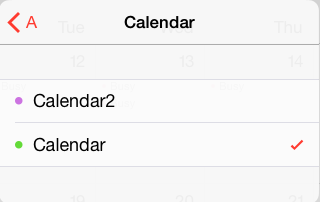 In iPhone Calendar, tap on the [+] icon in the top-right of the iPhone Calendar display. An Add Event display will appear. Fill in the fields as you wish. Note the Calendar field. This field will initially show the calendar you have set as your default in the iPhone Calendar Settings (see Settings -> Mail, Contacts, Calendar -> Calendars -> Default Calendar to confirm the current default calendar). Modify the calendar when you create a new event by tapping on the calendar shown and selecting from the resulting display your choice for the calendar to which you want the event to belong. After filling in the fields, tap on the red Done button to save the event. The Add Event display will go away and you can confirm that the event has been created by navigating to a view that shows the day on which you created it.